Geospatial intelligence - the linking of information about events, incidents, people and objects to place and time - is an area of increasing interest to me, and increasing importance to military personnel. Ahead of a number of further explorations in this area, I've been looking back over work I've done on the subject, and realised that a piece written for Defense Technology International last year, about a GEOINT programme run by and for the British military in Afghanistan, isn't available online. So here it is. This version is taken from the copy I submitted, so may differ slightly from the post-edit version that was published in the magazine. Making sense of the counterinsurgency battlespace is never easy, but new technology brings new tools to help front line troops and their commanders understand the distribution of potential threats in their areas of operation. 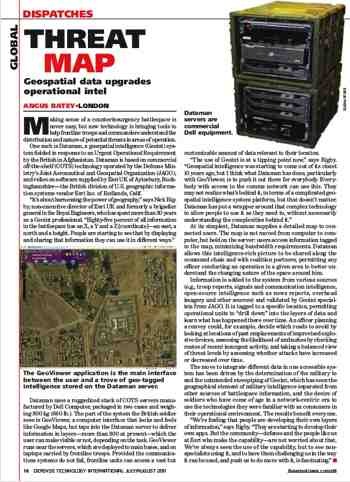 One such technology is Dataman, a Geospatial Inteligence [GEOINT] system fielded in response to an Urgent Operational Requirement by the British military in Afghanistan. Dataman is based on commercial off-the-shelf [COTS] technologies, operated by the Defense Ministry's JAGO [Joint Aeronautical and Geospatial Organization], and relies on a software backbone supplied by Esri UK, of Aylesbury, Buckinghamshire - the British division of the American geographic information systems [GIS] vendor Esri Inc, of Redlands, CA. "It's about harnessing the power of geography," says Nick Rigby, non-executive director of Esri UK, and before that a Brigadier in the Royal Engineers, who has spent over 30 years as a GEOINT professional. "Eighty-five per cent of all information in the battlespace has an X, a Y and a Z - an easting, a northing and a height. And people are starting to see that by displaying and sharing that information they can start using it in a different way." The physical manifestation of Dataman is a ruggedized stack of COTS servers manufactured by Dell, packaged in two cases and weighing a total of 300kg. But the part of the system the average British soldier gets to see is GeoViewer, a computer interface that looks and feels like Google Maps, but which taps into the Dataman server to deliver information in a series of layers - some 300 at present - which the user can choose to have visible or not, depending on the task in hand. GeoViewer can be run near to the servers, which are deployed to main bases, but also on laptops carried by front-line troops. Provided the communications systems do not fail, front-line units can access a vast but customizable amount of data relevant to their immediate location. "The use of GEOINT is really at a tipping point now," says Rigby. "Geospatial intelligence was starting to come out of its closet about ten years ago, but I think what Dataman has done - particularly with GeoViewer, the Google-like bit - is to really push it out there for everybody. Everybody with access to the comms network can now use this: they may not realise what's behind it, in terms of a complicated GIS platform, but that doesn't matter. In a sense, Dataman has put a wrapper around that complex technology to allow people to use it as they want and need to, without necessarily understanding the complexities that lie behind it." At its simplest level, Dataman supplies a detailed map to its connected users. The map is not moved around from computer to computer, but held on the server: connected users access information tagged to the map, thus minimizing bandwidth requirements. Dataman allows this rich intelligence picture to be shared laterally, permitting any officer conducting an operation in a given area to better understand the changing nature of the space around them. Information is added to the system from a variety of sources (including on-the-ground troop reports, signals and communication intelligence, open-source intelligence such as news reports, overhead imagery from aerial platforms, etc.) and validated by GEOINT specialists from JAGO. It is tagged to a specific location, permitting the operational units to "drill down" into the layers of data and learn about what has happened there over a period of time. In this way, an officer planning a convoy could, for example, decide which roads to avoid by looking at locations of past IED emplacements, or assess the likelihood of ambushes by checking possible routes for recent insurgent activity. The move to integrate different data types in a single accessible system has been driven both by the determination in the British military to end the unintended stovepiping of GEOINT, which has seen the geographical element of military intelligence effectively separated from other sources of battlespace information, and by the desire of soldiers who have come of age in a net-centric era to use the consumer technologies they are familiar with in their work environment. Traditionally a very specialised discipline, GEOINT is being opened up to the non-specialist user. The results benefit everyone. "We're finding that people are developing their own layers of information," says Rigby. "They are starting to, as they say in the world of Apple, develop their own apps. But the community - that's both defense and the people like us at Esri who make the capability - are not worried about that. We've always seen the use of the capability: but to see others using it, and to have them challenging us in the way it can be used, and push us to do more with it, is fascinating. "